The term "Concrete Cancer" is a colloquial or slang term for any one of a number of defects in concrete. The name has gained acceptance and is very apt because it is descriptive of a destructive process that over a period of time eats away at the concrete, with the condition slowly getting worse if it remains untreated..
For whatever reason when water penetrates the surface of the concrete and reaches the reinforcing steel then conditons may be favourable for the formation of rust. 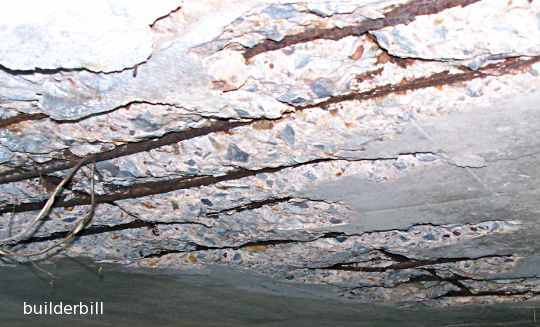 When steel is subjected to moisture and air, it will start to rust. Rust itself takes up to seven times more space than the steel it is replacing. The expansion forces of the rust inside the concrete cause the concrete to crack and spall. This in it's turn lets in more moisture which promotes more rust and so the process continues. So what appears first as a small crack that looks on the face of it to be insignificant, if the right conditions occur then it can spread into what we see in the photos here. The small cracks that contain moisture may be subject to freeze and thaw cycles which in turn can promote spalling of the concrete. The main cause of this problem is poor quality concrete. A lot of old structures are suffering from this disease, though at the time they were built it was thought that the concrete was quite good quality. The material used to make the concrete can be totally inappropriate for the job that it has to do. I once had to replace all the columns to a high set house that were made using beach sand in the mix. Modern engineers in general are specifying higher strength concrete and insisting on far greater quality control than was perhaps used in the old days. Even using good concrete it is still possible to have the right conditions for this to occur. These conditions can have any number of causes or a combination of a few of them. Harsh environment. The jobs that stick out in my mind in connection to this are coastal properties and salt spray. Pumping stations where chlorine is added. Even domestic swimming pools with their salt water or chlorine. To counteract this the engineer may specify sulphate resistant cement, increased concrete over and possibly using galvanised rebar. Poor work practises can also lead to the failure of the concrete to cover effectively the reinforcing steel. Little or poor vibration leaving "rat holes" in the concrete. These may be badly patched with poor quality mortar making it easy for water to soak into the structure. Not cleaning out the bottoms of forms and so leaving scraps of tie wire, nails and sawdust embedded in the concrete, which in effect just cuts down on the concrete cover. Not using bar chairs at all or not having enough of them to hold the rebar in position under the loads of men and material during the concrete pour. Once again this can reduce the cover. Concrete control joints. How to stop shrinkage cracks.